The Swift-Cantrell Park Foundation is celebrating 10 years of the Swift-Cantrell Classic! 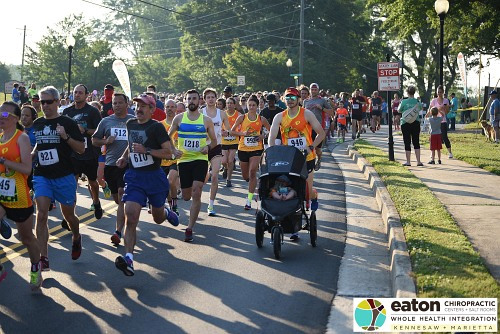 The Swift-Cantrell Classic 5k is the opening race of the 2019 Kennesaw Grand Prix Series. The race begins at the Kennesaw First Baptist Church, meanders through Swift-Cantrell Park, and finishes in historic downtown Kennesaw. The fast and flat race is professionally timed and serves as a qualifier for the Peachtree Road Race (GA1103OWC). Runners will cross the finish line into a post-race party in the City Plaza for the awards ceremony and celebration. Complimentary breakfast refreshments will be served post-race for all runners and friends.